By David Walther, UC Master Gardener of Butte County, March 2, 2018. Early spring is the perfect time to apply mulch to your garden. Mulch is any material that covers the ground and insulates it from sun, evaporation, and erosion. After you have finished your winter cleanup and pruning chores, but before the rains end is a great time to mulch, not only to provide the best environment for your plants, but also to help prevent the growth and development of weeds. Mulch is good for the soil, and thus good for your plants for a number of reasons. It jump-starts the useful work done by microscopic organisms (this is often referred to as microbial activity); retains moisture, thus preventing plants' roots from drying out; and deters weeds by providing a barrier between the soil and the sun. Mulching is also a time-saver for the gardener – it takes a fraction of the time to put down mulch that it would take to weed later on. 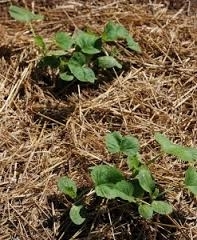 And using mulch to control weeds reduces the use of expensive herbicides. Mulch can be composed of organic or inorganic materials. Organic mulches include manure, compost, grass clippings, shredded bark, shredded wood, and even newspaper sheets (more attractive when covered with compost so the newspaper doesn't show). Pine needles can be used as mulch but they are very flammable, so it is best to chop or grind them up first. Shredded leaves from fall leaf drop make excellent mulch. Natural inorganic mulches include gravel, pebbles, and crushed stone. Other inorganic mulches are plastic, cardboard, and even pieces of old carpet. The mulch you use will depend upon the job you want the mulch to perform and how you want it to look. Any ground that needs enrichment, such as flower or vegetable beds you will be planting later in the season, will benefit from an application of organic mulch. Mulching around shrubs, trees, annuals, and perennials will improve the soil that feeds their roots, as well as deter weeds. Large areas that you wish to keep weed-free are also candidates for a thick application of mulch. Pile mulch six to eight inches deep, tapering down to three inches deep about 10 inches away from the stems or crowns of plants. Do not place mulch directly on top of plant crowns or too close to the trunk or stems of your plants, since a layer of mulch can cause the crown to rot. You can, however, apply mulch right on top of plants that do not have above-ground stems or crowns (such as bulbs, stoloniferous or rhizomatous plants). 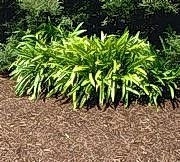 To control annual weeds, apply four to six inches of mulch on top of the soil, or even on top of the weeds themselves. To control perennial weeds, an application of 12 to 16 inches of mulch is needed. 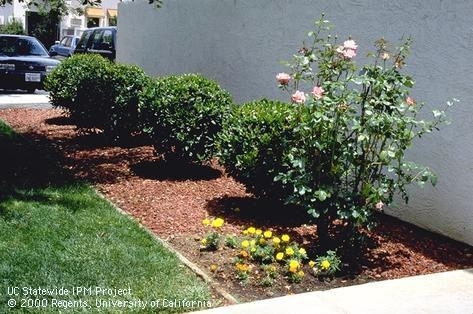 The reappearance of weeds in an area that has been mulched is an indication that the mulch has decomposed to such a degree that a new application of mulch is required. While the benefits of applying mulch are many, mulch can also lead to an increase in mole activity because of the increase in the worms and grubs they feed on – the more alive your soil is, the more it becomes a habitat for other creatures. Mulch can deplete the soil of nitrogen during the process of decomposition, so it is a good idea to supplement occasionally with applications of fertilizers rich in nitrogen such as manure, bloodmeal, feather meal (made from chicken feathers), or cottonseed meal. Finally, different garden situations require different choices of mulching materials: for example, dryland garden plants (xeriscape plants) such as native California plants, cacti, and succulents, have evolved to flourish in dry conditions and poor soil. The moisture-retentive qualities of organic mulch could be detrimental to their vigor and growth while the use of stone or gravel mulch would be helpful in replicating their natural environment. Your mulch choices can range from commercial mulches purchased at a landscape center, to bags of organic mulch available at nurseries and home improvement stores, to your own (free!) shredded leaves, grass clippings, and yesterday's paper. The benefits of mulching far outweigh any negatives, so there is no reason not to mulch. Questions? Plant problems? Call the Master Gardener Hotline at 530-538-7201 and/or visit our website Hotline page at ucanr.edu/p/49588. By Michael-Anne Foley, Butte County Master Gardener, January 22 2016. When is soil more than just dirt? When you want to grow healthy plants in your yard and garden, the soil is as important a factor as are water and sunlight. You can improve your soil's ability to support thriving plants of all kinds by protecting it from compaction, amending it with nutrients, and adding mulch as a top dressing. 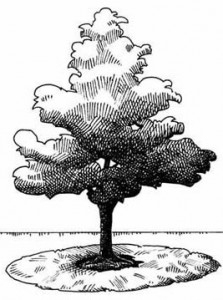 An ideal soil includes various proportions of clay, sand, humus, water and air. You can smell a good soil! Why is Compacted Soil a Problem? Compacted soil has less air and is less porous than well-aerated, friable soil. This means it is harder for roots in compacted soil to grow and harder for those roots to get air. Restricted roots are often unable to take up sufficient water or nutrients from the soil. These conditions inhibit plant growth, particularly during drought if soils are dry. 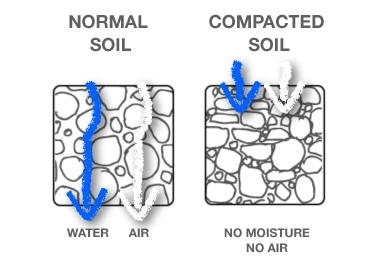 Compacted soil layers can either hold water in (by creating poor drainage), or keep water out (by preventing inadequate water infiltration and creating conditions that are too dry for plant growth and development). A large number of organisms make up the “soil food web.” They range in size from tiny one-celled bacteria, algae, fungi, and protozoa, to nematodes, earthworms, insects and plants. These organisms are beneficial to plant health but also have difficulty living in compacted soil. Keep foot traffic limited to a few areas in the garden by using consistent pathways. Avoid walking on wet soil and in areas where you have recently loosened the soil. Working compost into soil can help alleviate soil compaction by improving soil structure, aeration, and water-holding capacity. Soil amendments improve the physical properties of soils. They increase the water and nutrient-holding capacity of soil and improve aeration and water infiltration. Soil amendments are more than simply fertilizers. Fertilizers (especially synthetic chemicals) add nutrients to the soil for immediate use by plants, but little is retained in the soil. Soil amendments such as compost, humus, worm castings, and aged or composted animal manures improve the soil by making its texture and drainage more conducive to plant health. Soil amendments add nutrients to the microbes in soils, and the microbes then make those nutrients available to plants. The soils that help our foods and landscape plants grow are not sterile but are filled with microbes that are unseen by human eyes. These microbes make our soils healthy and productive. Amendments are best chosen for the needs of the soil based on how the plants are performing. Landscape plants, annual flowers, and vegetables all have different needs. Commercial producers of amendments tailor blends to generalized garden uses. Some companies offer specific combinations of amendments for specific needs. Worm castings and homemade compost have been found to be among the best amendments because their ingredients are completely broken down and plants cannot be burned by concentrated synthetics. Mulch can be organic or inorganic. Each type has its uses in the landscape. Yard waste: grass clippings, leaves and small twigs can be used as mulch in moderation and may be best for use behind bushes or borders. Mulching with yard waste functions better when it is composted first. Because yard waste tends to look unsightly, a uniform mulch is often more attractive. 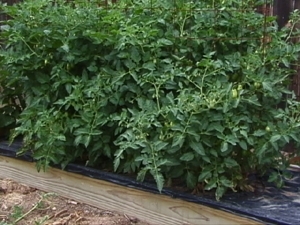 Straw keeps weeds down and is good for vegetable gardens. It has a short life span. Pine bark and needles are good for weed control. Barks last longer, while needles allow water through. Wood chips: bark and wood pieces are attractive, provide good weed control and save water. Landscape cloth of a woven material provides good weed control, allows air and water to pass through and, if used with organic mulch, can save time and labor for years to come. Black plastic can work well for annual plants like strawberries that can be planted through holes in the plastic mulch. Landscape plants, however, will not get enough air, water or nutrients. Rocks and gravel are relatively permanent but can be expensive. Decomposed granite tends to stay in place and look tidy. Spread a two-to-four-inch layer of organic biodegradable mulch over tree roots, shrubs and plant beds. Keep mulch two inches away from the woody trunks of trees and shrubs. Replenish annually or as needed to keep a two-to-four-inch layer. This depth is ideal for weed suppression and water conservation. As you plan your 2016 garden, keep in mind the importance of keeping the soil aerated by preventing compaction, amending the soil, and mulching to conserve water and fight weeds. Since this is shaping up to be one of the driest years in California history, it's appropriate to look at ways to conserve water in the home garden. A good starting point is the garden soil itself. Sandy soils tend to drain too rapidly, while heavier clay soils may drain poorly and not provide sufficient oxygen for plant roots. Adding organic compost to the soil will help rectify both of these situations. Organic material increases the water-holding ability of sandy soils and loosens clay soils, so that they are better aerated. A lawn is normally the single greatest water-user in the home landscape, so unless it serves a specific purpose, such as entertainment, or a play area for pets or children, you might consider replacing it. Lawn substitutes can include planters, ground covers, mulches or hardscape features such as decks or patios. If you choose to have a lawn, the type of turf will affect water use. Warm season grasses such as Bermuda grass, St. Augustine grass, or zoysia grass typically require about 20 percent less water than cool season grasses like tall fescues or bluegrass. Water only when necessary. If you step on the lawn and it springs back when you move your foot, it doesn't need water. Aerating the lawn will maximize water penetration and the duration of watering should be timed so that excess water does not run off of the lawn due to saturated soil. Adjust sprinklers so that water does not end up on concrete or gutters where it is wasted. For lawns and all landscape plants, watering in the early morning hours when wind and temperatures tend to be low means less water will be lost to evaporation. If you are deciding what to plant, California natives from our climate zone are a good choice. They will need regular watering at first, but can often survive with little more water than they receive from average rainfall after they are established. Try to limit the use of plants that require frequent irrigation and, for efficiency, group them in areas where they can be watered together. All plants should be watered only when necessary. Check on soil moisture and adjust your watering schedule frequently to reflect seasonal variations in temperature, wind and rainfall. Any plants with similar watering requirements should be grouped and watered with separate valves. Although sprinklers are the best way to water lawns, the most efficient way to water other plants is with drip or soaker hoses. This minimizes water loss through evaporation or runoff. Infrequent, deep watering results in deeper root growth, which in turn allows plants to develop greater tolerance for hot, dry weather. It is important to maintain your irrigation system, checking for leaks, broken sprinkler heads, clogged drip emitters and other problems that could result in wasted water or stressed plants. Mulch is yet another component of home water conservation. 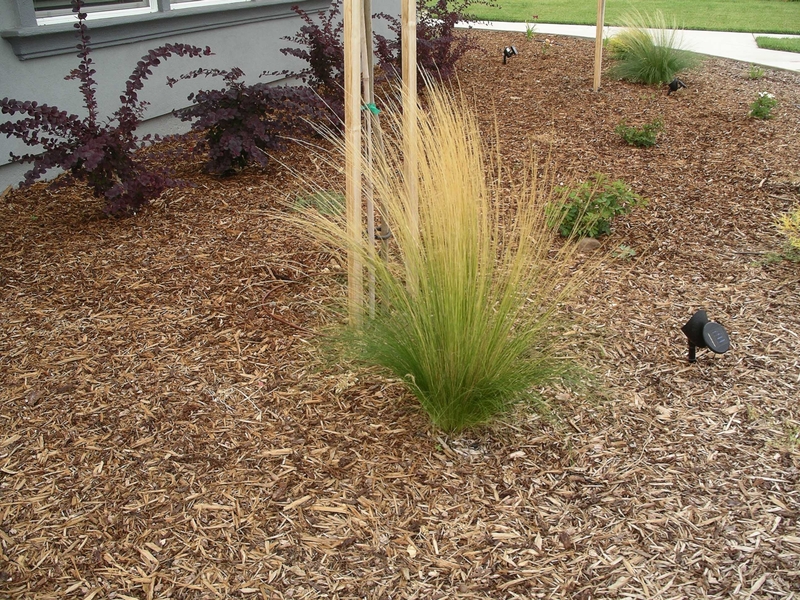 A three- to four-inch layer of mulch reduces evaporation of water from the soil and stops most weed growth. Eliminating weeds prevents them from competing for soil moisture. Mulch also helps maintain a constant soil temperature and organic mulches break down over time, enriching the soil and improving soil structure. Do not place mulch in direct contact with the trunks of trees and shrubs. By keeping mulch several inches from trunks, fungal diseases and insect activity are discouraged. A drought year is not the time to engage in excessive pruning. Such pruning can lead to heavy plant growth and a resulting increased demand for water. Light pruning during the winter can shape a plant without stimulating excess growth. And early summer pruning reduces vigor, leaf area and water demand without stimulating excessive growth. Over-fertilizing can also result in excess plant growth and extra water consumption. There are several advantages to mowing lawns slightly higher during hot weather. Their growth rate is slowed (reducing water demand) and deeper root growth is encouraged. Taller grass also shades the soil, which lowers evaporation and reduces weed seed germination. Finally, think twice before running water. Indoors, for example, flush the toilet only when necessary. Turn off the tap while brushing your teeth. Capture water in a bucket or a large pot while the shower or the dishwater is warming up and use it to water garden plants. Using a broom instead of the hose to clean a driveway can save hundreds of gallons of water. Leaving the hose running while washing a car can waste 150 gallons of water; instead, re-fill a bucket with water as needed, and turn off the hose. It's often just a matter of common sense. Mulch is good for the soil, and thus good for your plants for a number of reasons. It jump-starts the useful work done by microscopic organisms (this is often referred to as microbial activity); retains moisture, thus preventing plants’ roots from drying out; and deters weeds by providing a barrier between the soil and the sun. Mulch can be composed of organic or inorganic materials. Organic mulches include manure, compost, grass clippings, shredded bark, shredded wood, and even newspaper sheets (more attractive when covered with compost so the newspaper doesn’t show). Pine needles can be used as mulch but they are very flammable, so it is best to chop or grind them up first. Shredded leaves from fall leaf drop make excellent mulch. Your mulch choices can range from commercial mulches purchased at a landscape center, to bags of organic mulch available at nurseries and home improvement stores, to your own (free!) shredded leaves, grass clippings, and yesterday’s paper. The benefits of mulching far outweigh any negatives, so there is no reason not to mulch. Just Don’t Call It Senior Gardening!